Laurel LPC-2R Series — C&A Associates, Inc. The ever-popular Laurel Coin Wrapping Machines have been refined and further improved for the development of a new version. We call this “Revision 2.” Despite the high acclaim our Coin Wrapping Machines have received, we have continued to work on improving them based on field assessments and customer feedbacks. Revision 2 boasts phenomenal durability and reliability to ensure long-term customer satisfaction. The user-friendly panel gives an easy-to-see and foolproof, clear visual operational guidance. All counting and wrapping procedures are illustrated and instructed to the operator on the Operation Panel. With the LAC-16 Series Revision 2 coin jam and error recoveries are easy. Its unique mechanism clears jams speedily and automatically and the Machine continues the job without interruption. On top of that, foreign coins, smaller/ larger diameter coins, odd coins and irregular coin stacks are automatically rejected into the Clear Box/Sort Box with the number of coins rejected automatically deducted and shown on the count display. 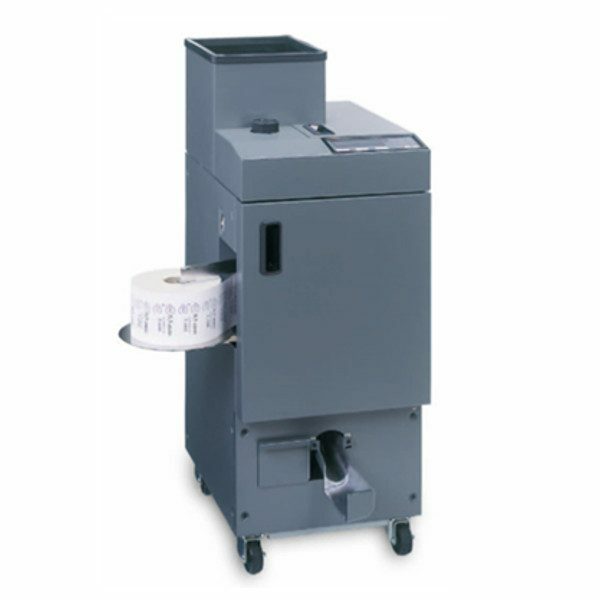 LAC-16 Series Revision 2 uses a universal cam and memory card which makes it quick and simple to change coin wrapping specifications. When a new coin or token starts circulating in the market, all you have to do is simply install a new memory card from Laurel in which the necessary data of the new coin or token is registered and let the LAC-16 Series Revision 2 do the rest of the job.